The Final Fantasy 7 Remake had two new screenshots unveiled by the game's director Tetsuya Nomura during this year's Magic Monaco 2017 event. Both screenshots are from the first mission in Final Fantasy VII which takes place in Midgar's Sector 1 and involves Cloud and Barret blowing up a Mako reactor. The first screen shows the duo battling Guard Scorpion, one of Shinra's security robots, and the first boss of Final Fantasy VII. 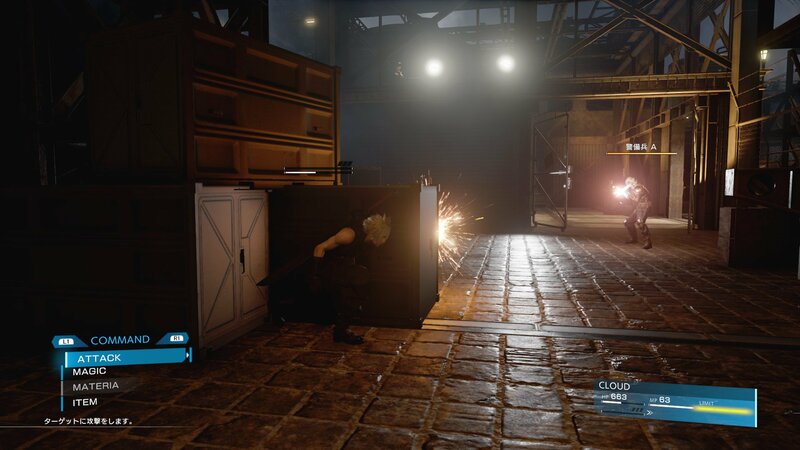 The second screen shows Cloud ducking behind some boxes as a Shinra trooper fires on him. Barret hasn't yet joined you so it must be near the Sector 1 train station before you make it to the entrance to Reactor 1. The game looks stellar so far, but there are some questions they raise. 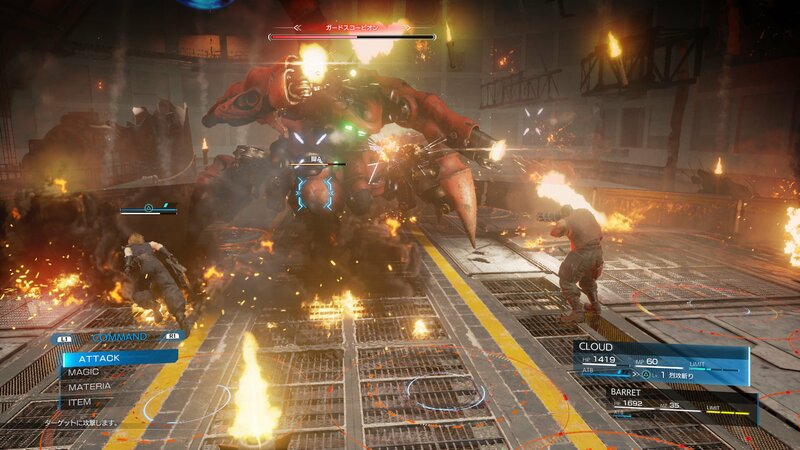 In the Final Fantasy VII Remake Guard Scorpion boss fight, the camera seems oddly focused in a center view, as if players are giving each character commands as opposed to controlling them individually. There is also a new "ATB" gauge under each character's name that could only stand for "Active Time Battle" which was Square Enix's name for the original battle system from Final Fantasy VII and other iconic games like Chrono Trigger. This is a change from the Final Fantasy 7 footage we saw at PSX 2015 that featured a battle style more in line with Final Fantasy XV and may be an indicator that the FF7 Remake team isn't straying as far from the original formula as previously thought. Other than the two screenshots above Nomura had nothing new about the Final Fantasy VII remake. He stated that he had wanted to show a video at the event, but was voted down by his colleagues. There was also a screenshot shown from Kingdom Hearts 3 at Magic Monaco, but again, no new info offered on the title. 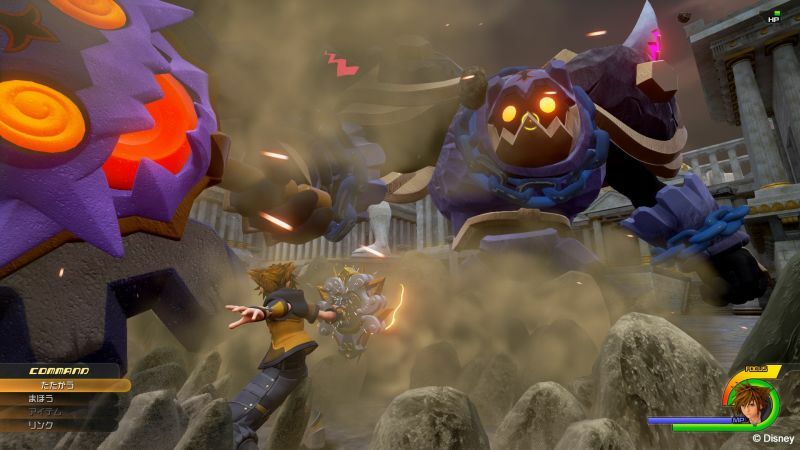 The release dates for both Kingdom Hearts 3 and Final Fantasy VII remake are nationally guarded Japanese secrets, and we have no clue as to when we'll finally see them. Saw FF7 on steam sale this weekend and I barely stopped myself from buying it. What's the deal with the remake? Only thing I ever heard was that they weren't going to do it because the game scope was too big and they couldn't possibly re-create it all with top-tier graphics. Is this remake just going to be a highlights thing of FF7 key moments or is it going to be the full game all the way through? Going off of memory but I thought last I heard its going to be a revamp and possibly split into parts. For sure isnt going to be exactly the same path as the original. They're doing the whole game but I think it'll be in episodes is what they said. The FF7 Remake was announced at E3 2015. Square Enix is planning to split the title into three games, not episodes, with each game being a self-contained entity. It's being powered by Unreal Engine 4 and original character designer Tetsuya Nomura is directing character redesigns, original director Yoshinori Kitase has returned as the project's producer, and original scriptwriter Kazushige Nojima has returned to write scripts for all three games. Any word on Nobuo Uematsu for soundtrack? My god... I can't wait to experience that world again with everything modernized. FF4's remake on DS is one of Square's best RPG's ever. I have very high expectations for this.